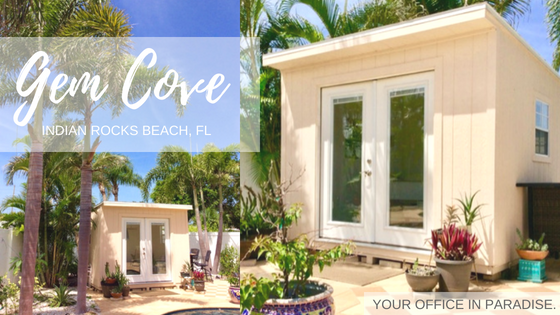 Click on “Reviews” to see what our fabulous clients are saying about the GEM COVE office rental at Indian Rocks Beach! I recently vacationed in Indian Rocks Beach and it was a much needed getaway as my work schedule is really insane. That said, I had the pleasure of meditating in Chelsea’s Gem Cove every morning. It’s such a wonderful, inviting space and really allowed me to open up to the universe and set my intentions for each day. If you need a relaxing, zen atmosphere for anything whether it is work, reading a great book, meditating or just a few hours away from your hectic day to relax…you should absolutely try the Gem Cove! I wish I had a space like this to work in every day! Thank you so much for your review, Kendra! I’m so glad you enjoyed your time here and look forward to having you back soon. I recently was having renovations done in my home and since I also work from home this was a problem. The Gem Cove saved me on more than one occasion when I needed a very quiet space for client calls. In addition to be quiet, it’s peaceful, very clean and has lots of light. I highly recommend this space! I have been fortunate enough to use the Gem Cove on multiple occasions. Whether utilizing the quiet to accomplish daily tasks such as phone calls or taking in the beautiful surroundings and simply giving myself creative time to brainstorm and explore new ideas. Having this space away from life’s daily distractions sparked ideas and productivity that otherwise are sometimes hard to capture. I look forward to putting the space to use again soon! Thank you so much for your wonderful review, Sierra! We look forward to having you back soon. I have been to the Gem Cove on several different occasions. It is light and cheerful with a zen atmosphere and lots of positive energy. I have been trying to catch up on some writing, and find I am too distracted in my own home. The Gem Cove takes me away from those distractions and allows my creativity to flow. My most favorite thing to do in the Cove is meditate. It is such a safe and calming space that allows me to open my heart and mind to the universe, and set my intentions for the day. I feel at peace and energized when I leave. I would highly recommend this space! I’m so glad you enjoyed it, Lindy! Looking forward to having you back! I loved my time spent inside the Gem Cove working. The space is bright and the energy is so good (peaceful, energizing, and it’s crystal clear). I look forward to going back and hammering out more in this unique spot. Chelsea and her cove truly are gems! I’m so glad you had such a productive and energizing time in the Gem Cove, Nicole! Looking forward to having you back!